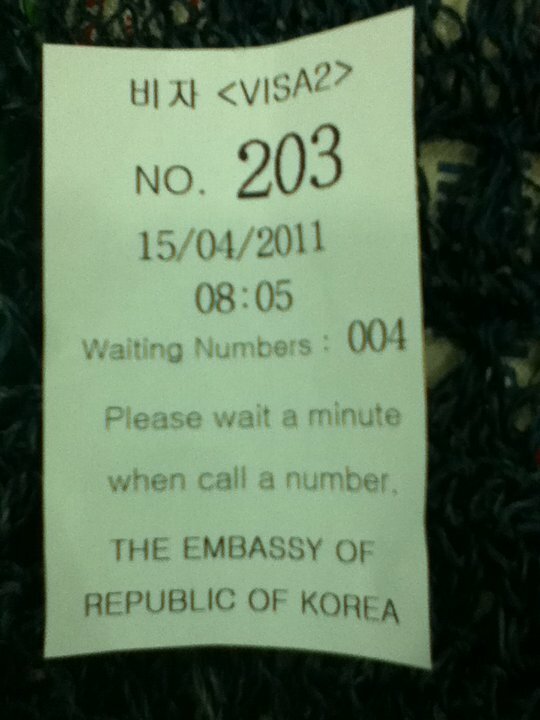 It's going to be a year from now since I last set foot inside the Korean Embassy. I am a QC resident so getting to the embassy in Taguig was a long travel. But since my brother and I needed a visa for a trip then, we braved the roads towards the south area. 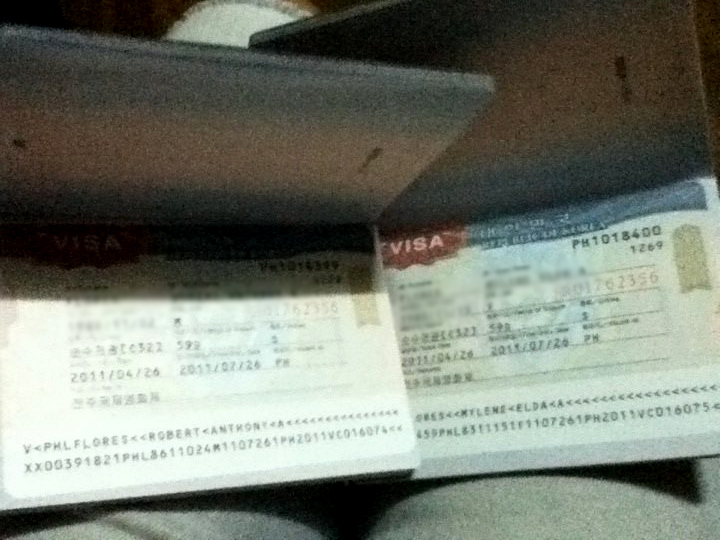 My Kuya, my younger brother and I were invited to partake in Jeonju's International Film Festival, so we made sure to apply for our respective visa's right away. My boyfriend who's been to South Korea several times now (for work purposes), was able to help me compile all of our visa requirements. 1) Application form duly filled in and signed. 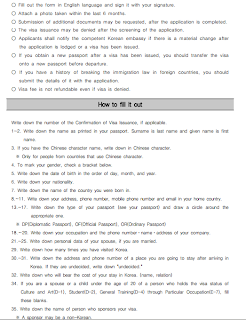 The form can be obtained on this link. 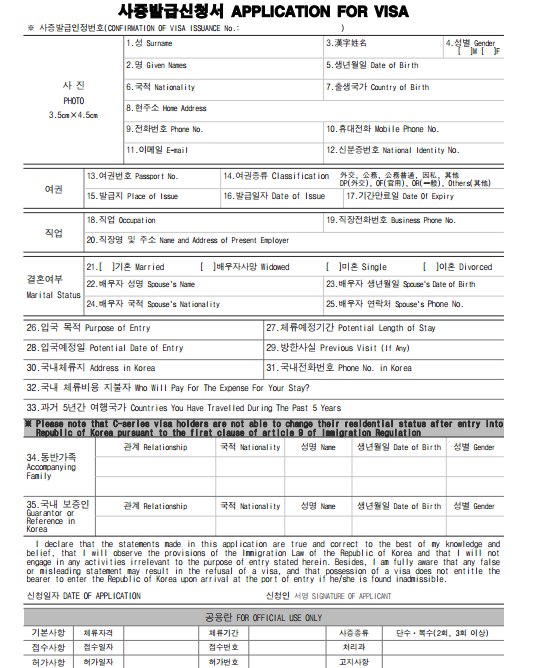 4) Photocopy and original of previous and valid visas to U.S., Canada, Australia, Japan, New Zealand, or Korea. Also note that there will be other required documents that may be asked of you by the consulars. And this will solely depend on your occupation and purpose of visit to Korea. So in my case, I would fall under the BUSINESSMEN category, applying for a Tourist or Visitor's Visa. 3) Business Registration from S.E.C. Now, A WORD OF ADVICE. It's best that you've accomplished and gathered all of the important documents before passing these to the consulars, as this will help you avoid the hassles of going back and forth the embassy. I've actually witnessed a few applicants who lacked the necessary documents, so the consulars requested that they just return with the missing papers on their next visit. Ok, so when you're done compiling your papers, you may then file your application at the Consular Office from 9-11am only, Monday to Friday. So be sure to come in at an earlier time (we were already in line by 7am). And since the embassy serves on a first come, first serve basis, no appointments are necessary. And upon entering, first time travelers like me, were advised to pass our requirements on either Windows 1 or 2. We were also given a queue number. Since only one representative was required (the actual applicant need not be present when applying for a visa, just as long as the required documents are passed and completed), I was the one who faced the consular. We talked for a bit, and then she asked for all of our papers, which was then followed by a few reminders. The lady gave me a piece of paper that indicated my return date to the embassy. In our case, we were asked to come back after less than a week. 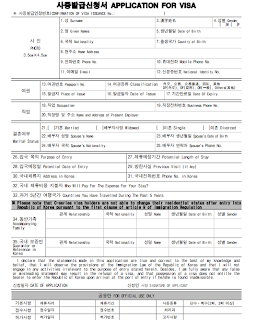 Now, if you're a first time traveler to Korea, it is advised that you personally claim your visa, especially if the Consul requires an impromptu interview with you before releasing both your visa and passport. But if you hold an American Passport, then you'll be required to pay the PHP2,025.00 fee. As for Foreign nationals in the Philippines (those applying for a tourist visa), a PHP1,350.00 will be charged accordingly. tama.. i agree sa word of advice mo dapat pag pupunta ka sa embassy dala mo na ang lahat ng kailangan mahirap ang pabalik-balik gastos sa pamasahe. but i think, KOREA is quite a boring place to explore maybe just a visit will do. i wonder why most KOREANS wish to stay in our country? anyways, useful post for those who are interested. Hey Robi! I spent my trip in Korea last year pa.. Thanks still! This is such important info for world travelers. Thanks for sharing! wow to the fees, gratis lang! @Marri, I think it's to learn English? ahihi. Would love to see the Yognduam Rock in Jeju! this is very informative. thank you for listing down all the requirements and fees. very helpful indeed. i've always wanted to go to korea but i haven't convinced my life's higher authorities yet. my destination this year is Singapore, but hopefully i can go to Korea next year! I should bookmark this page because I need to get a via for Korea soon. I just passed the TOPIk exam and I'll be working in Korea soon. Thanks for this post. getting a visa es really a hassle.i have been to a lot of visa application and it very frustrating if you were denied or missing documents. So to make sure i don't miss something ,i bring all the big folder with me containing all my docs and paper works so when the consul ask for something ,i easily hand it . Ah, good insight Chan! 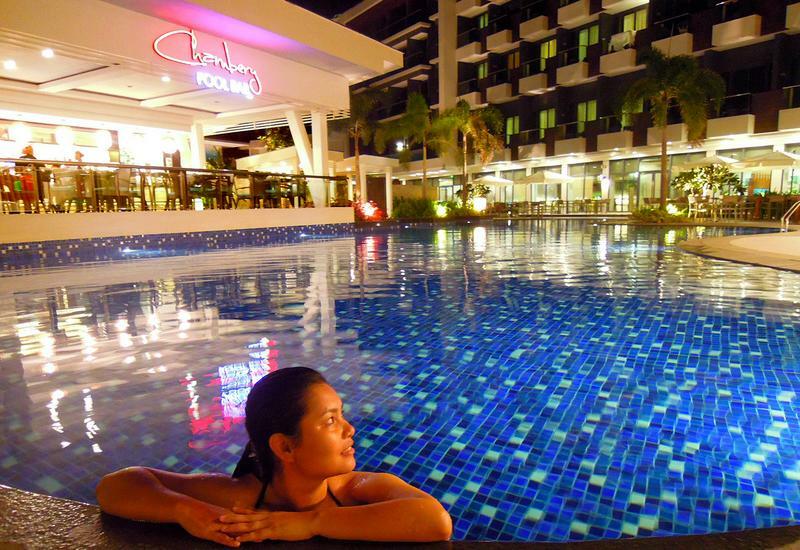 The school rates may be cheaper here, compared to their country. And must I say that I had to google the Yognduam Rock? hehe.. the rock formation is actually remarkable! Cool! What month are flying to SIN? I'm sure it's going to be hot there for the next couple of months. Thanks for this information. 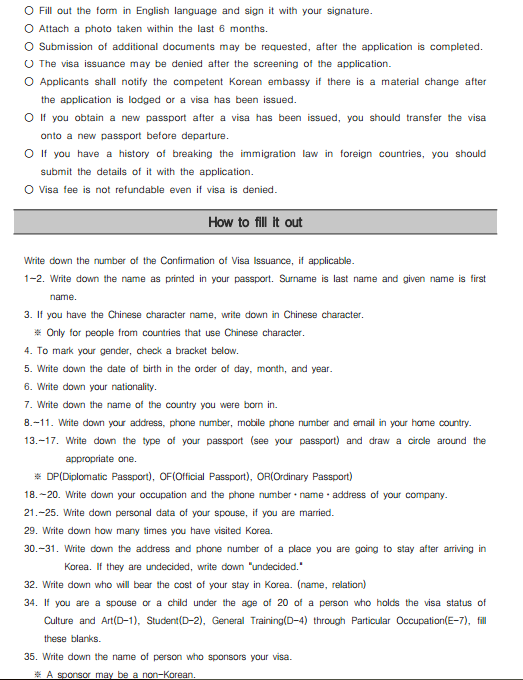 This is a big help to others who are planning to visit South Korea. I agree, you have to make it sure that everything would be complete para swabe ang application. Swerte mo naman at may invitation ka sa Korea! wow.. it was you who posted about getting US visa right? (I hope my memory serves me right!) now this... great postssss! Hi Gemma! I think that's me. =) Thank you for remembering. At least for this specific post, I finally got approved of a visa..hehe! I'll bookmark this just in case my neurosurgeon allow me to travel soon! This is is a neat tip! Please swing by my pagetoo! Thank You! =) Hope your neuro approves of your future travel! timely post. we're planning to visit south korea next year. sana mabigyan din.